This afternoon, unlike the weekend, is sunny but not actually all that warm. The weekend was icy cold with rain and wind and Monday morning I awoke to what looked like frost but was either frozen ice crystals or strangely transparent hail. 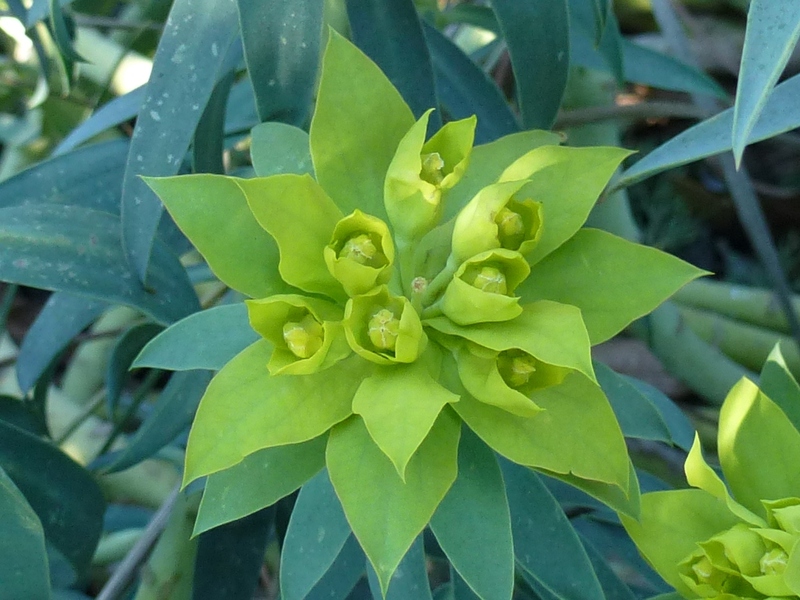 The first Euphorbia to open its inflorescence is E. rigida. 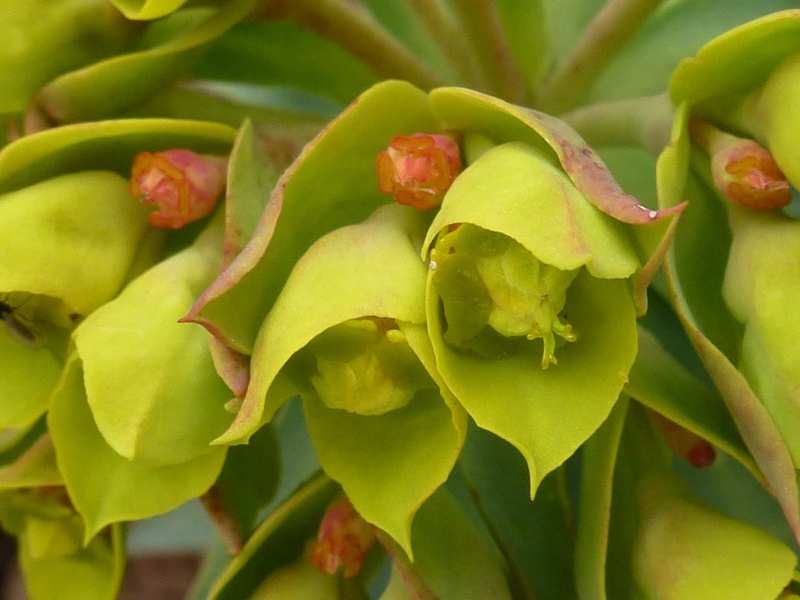 I really don’t understand the name of this variety because of all the Euphorbias I’ve seen this one sprawls the most! 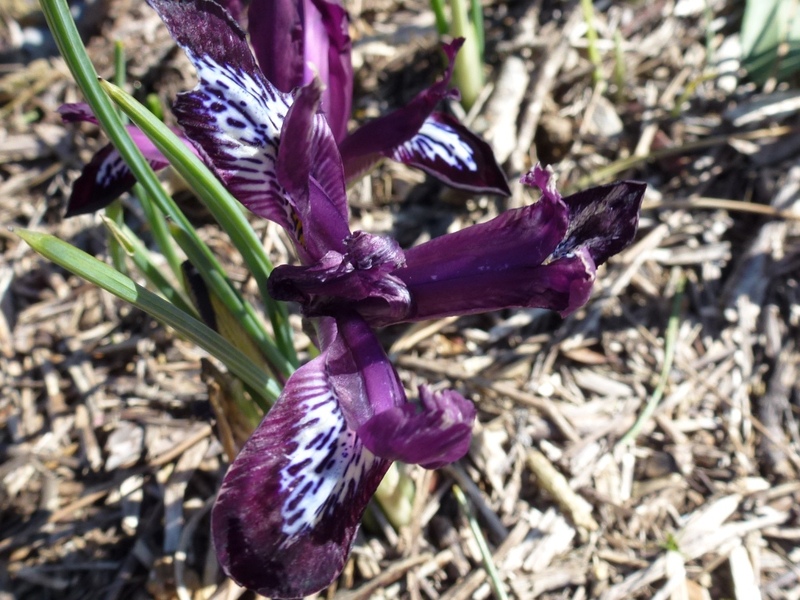 But I like it for its strange habit and the colour it adds to the garden so early in the season. In my post for GBBD (Garden bloggers Bloom day) it wasn’t showing the characteristic orange true flowers, now it is fully open and showing its cheerful colour to the world. First I apologise that I’m late with the post for my meme; my only excuse is pressure of work and that I’ve had a virus that has left me without any energy. 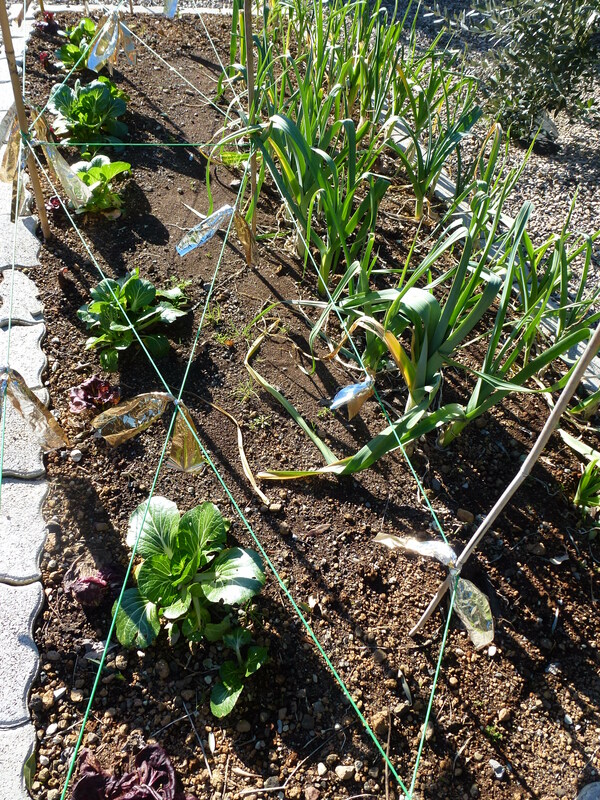 PBM garden’s post is here and Lead me up the garden path here. Thank you for joining in. 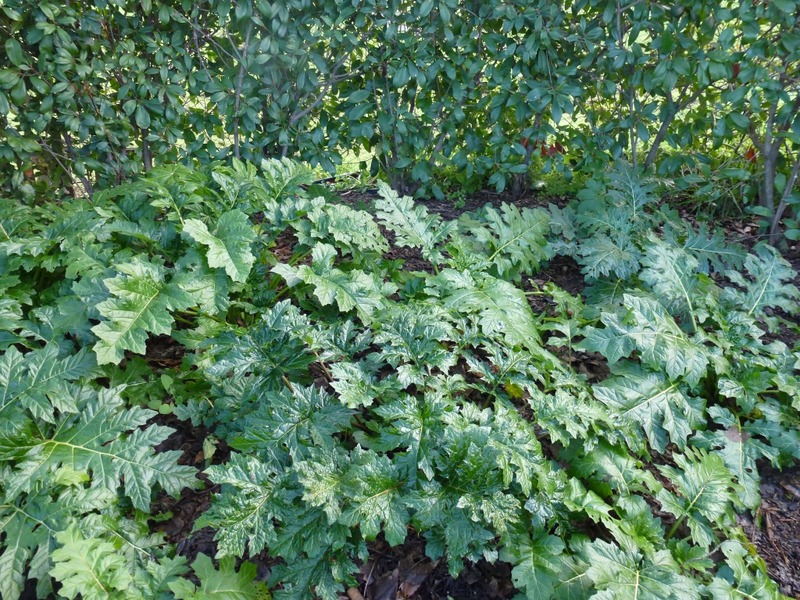 I find this plant interesting because it behaves completely differently here in Italy than it did in my garden in the South of England (which was also free draining gravely soil in a south facing garden. So although obviously the summer temperatures in England are much lower and there is more rain the winter conditions really aren’t so different, possible temperatures get a little lower here in Italy but also there are more sunny days. But that isn’t how they grow here. With the first rains of early autumn the foliage appears, new and fresh and shiny. They remain evergreen all winter, their beautiful architectural leaves filling the space under the Mulberry tree. 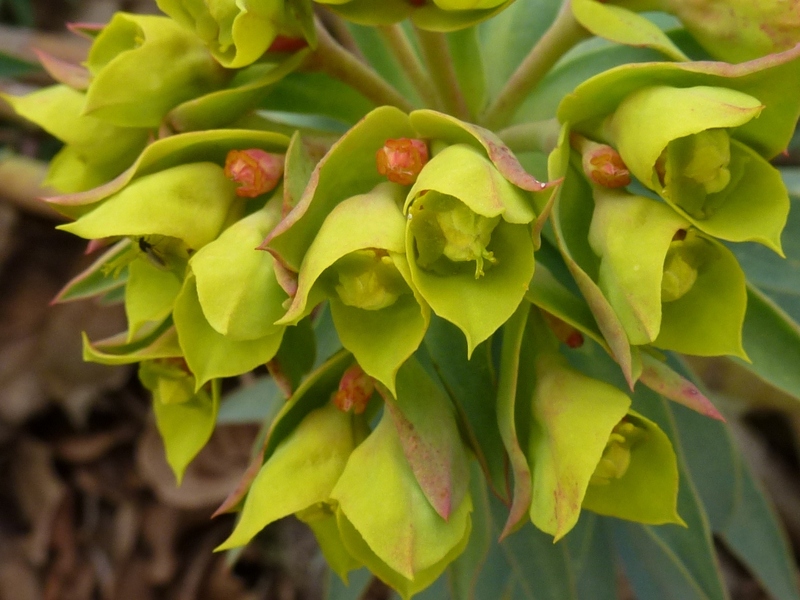 In late spring and early summer the flower spikes appear. 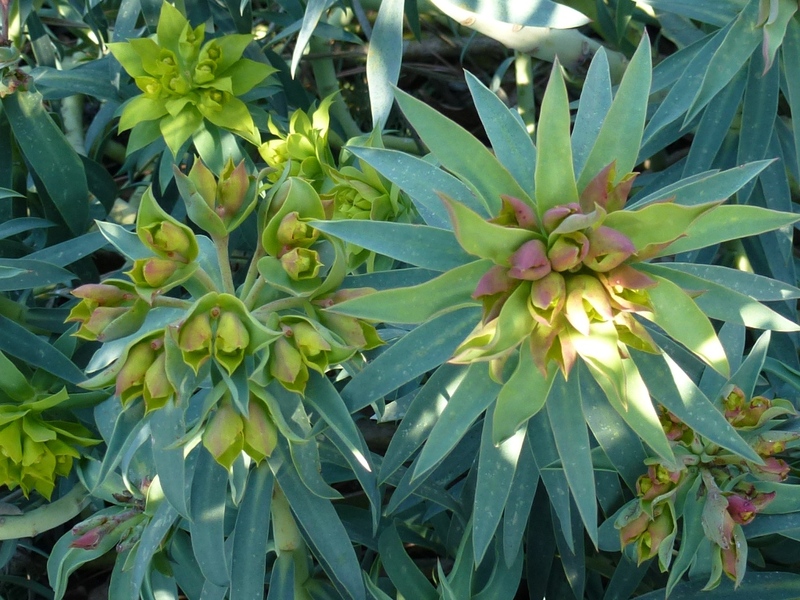 By the end of July the plant is in summer dormancy, the leaves shrivelled and brown and the flower spikes spreading their seed. 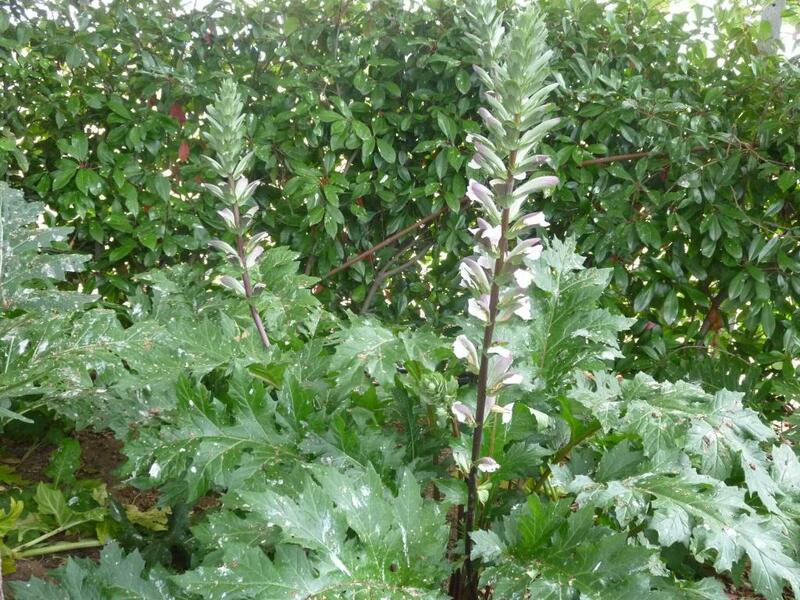 I grow Acanthus for its glossy green leaves when little else is in flower. I need to combine them with something that is flowering or interesting in July and August; if you have any suggestions they will be gratefully received. To join in GBFD please post and leave a link with your comment here. Thank you for joining in and again my apologies for being late this month. The few flowers there are in the garden at the moment at very precious to me as a sign that spring is on the way. 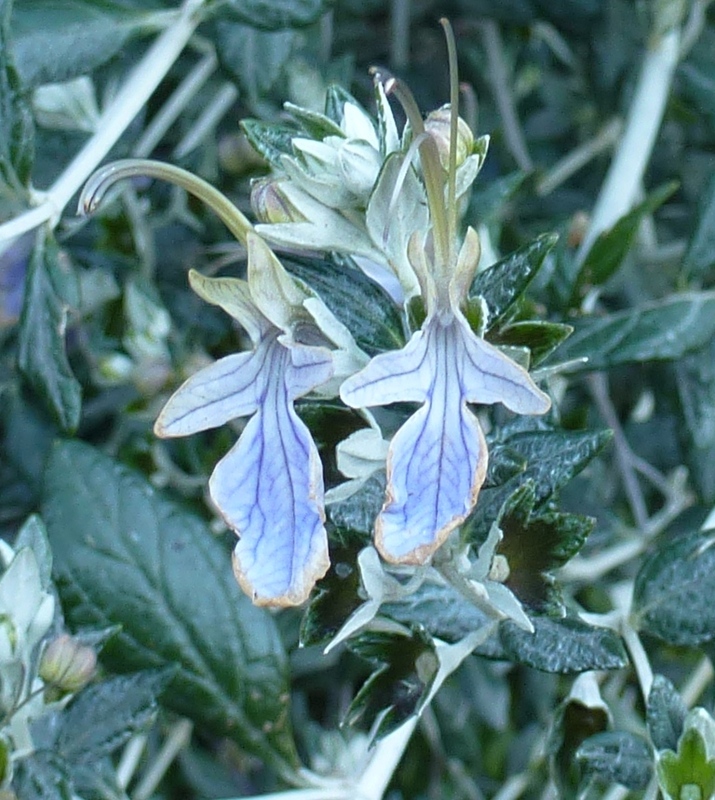 Teucrium fruticosa flowers continuously from November through to April so though the flowers are small, they are profuse so they add a blue haze for many months. 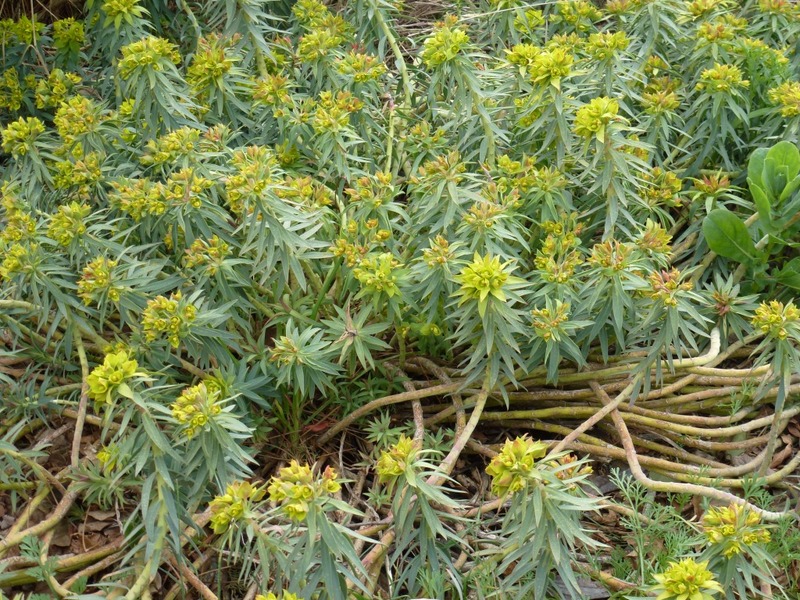 Euphorbia rigida is the first to show signs of the acid yellow inflorescence that proclaims spring is here! 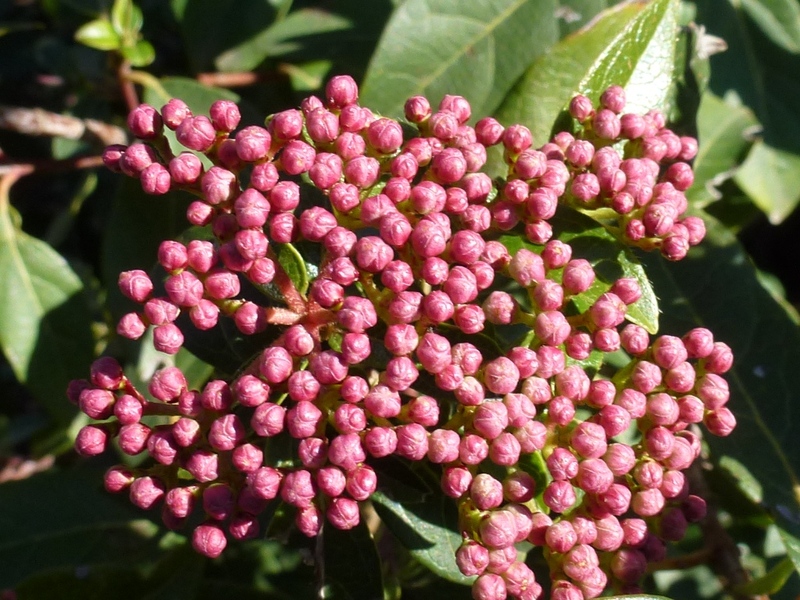 First pink colouration appears as the ‘buds’ swell, then they open to reveal bright, acid yellow/green. 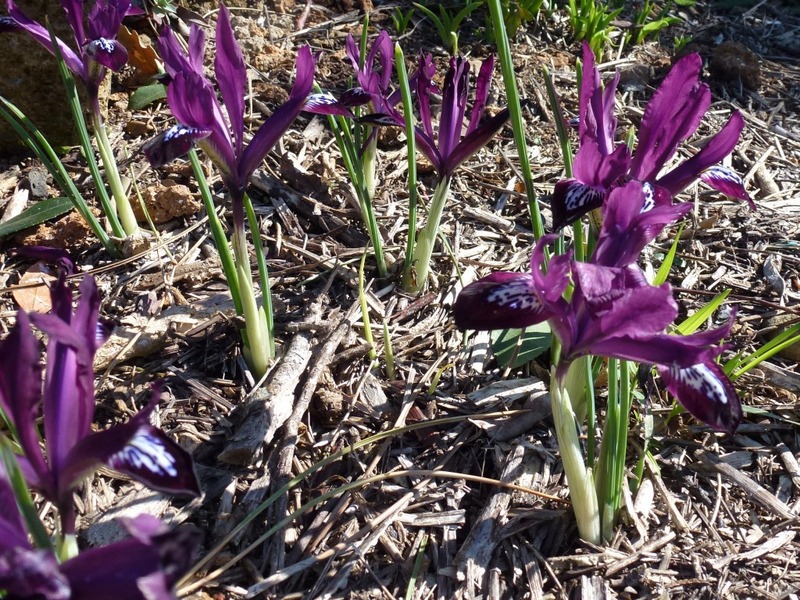 These small Irises are one of my favourites, they don’t last very long and it can be easy to miss seeing them at all, but they don’t cost very much so I’m prepared to indulge myself. 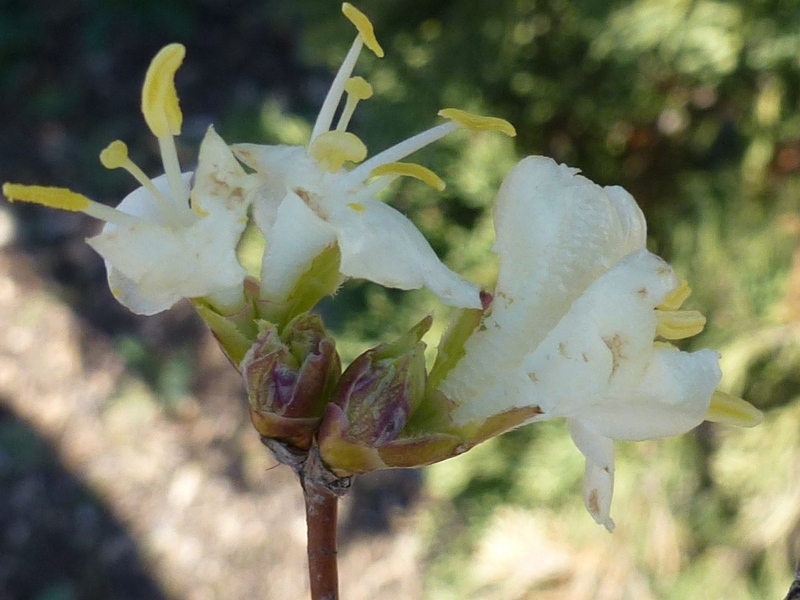 Lonicera fragrantissima has the very best perfume of any plant I know! 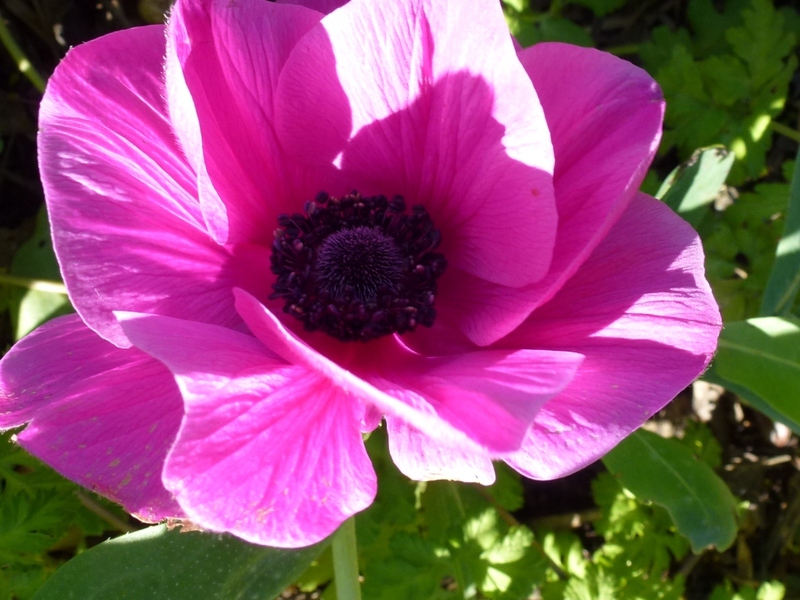 It doesn’t flower for as long a period here as it does in the UK, it needs some cold to trigger the flowers. 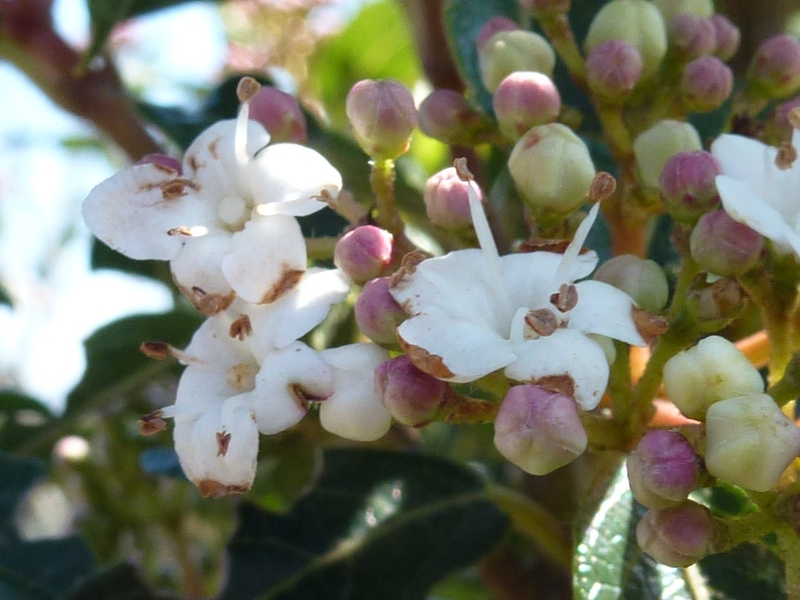 Viburnum tinus is mostly tight pink buds with just a few open to revel the white flower inside. 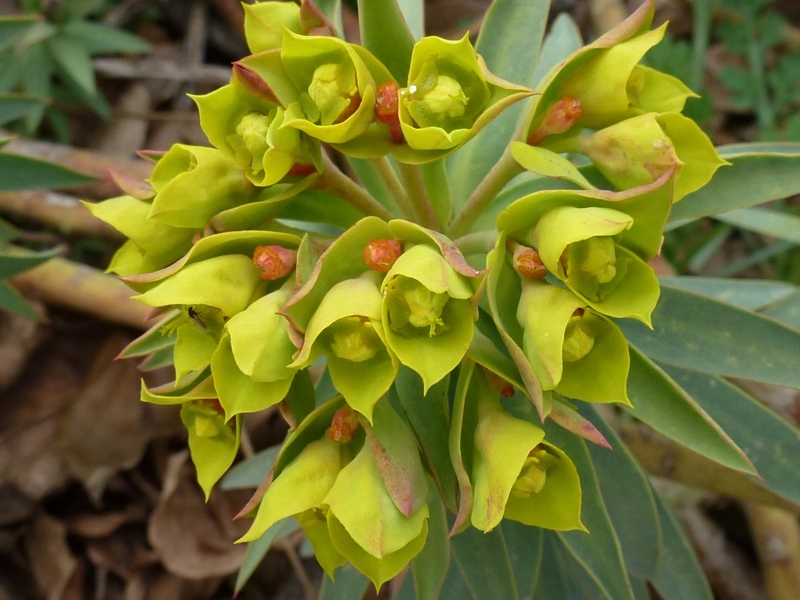 This is another plant that does not flower for such a long period as in the UK where it flowers for maybe 6 months of the year. My plant has not fully recovered from the burning winds during the summer and a couple of large stems still seem to be dead. I’ll prune them out later in spring if there really is no chance from them recovering. 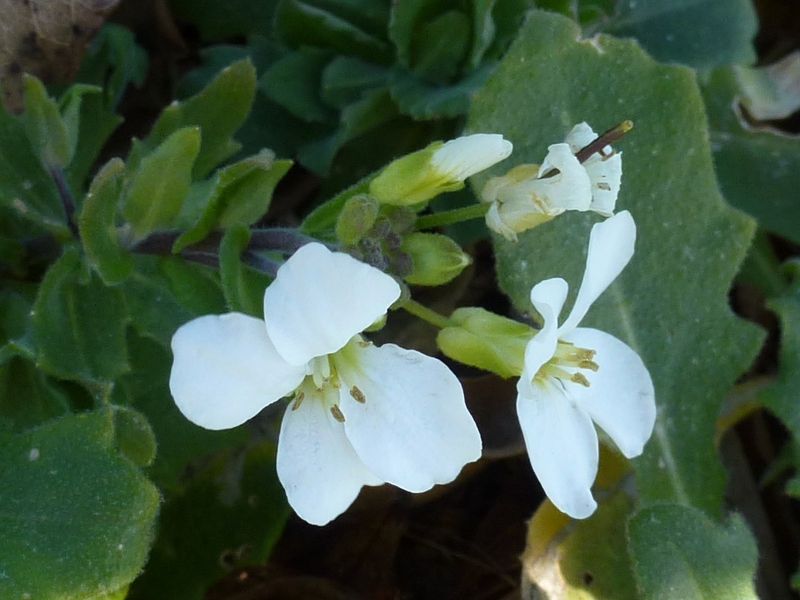 Arabis, grown from seed is full of tightly closed buds, but a few are braving the cold nights. 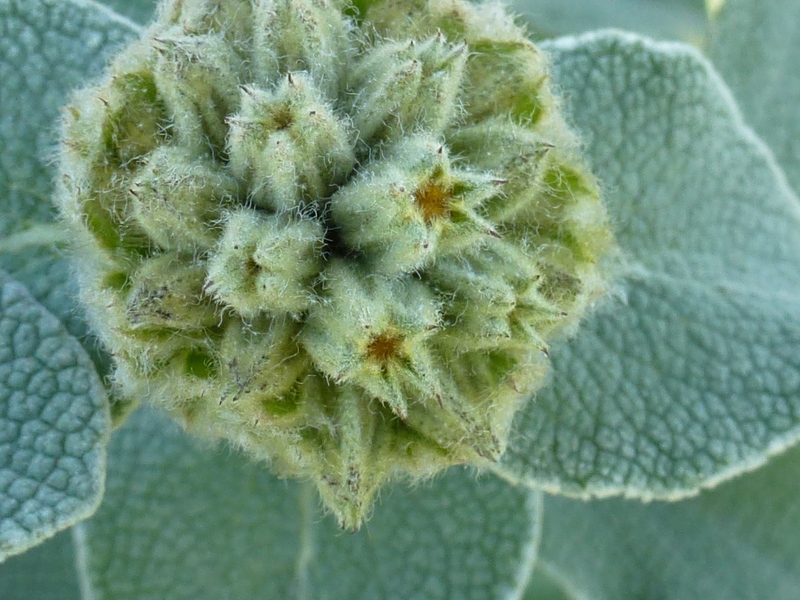 A surprise is that one Phlomis sufuiticosa has buds that are nearly open, while another plant, perhaps a metre away, doesn’t even have any buds yet! 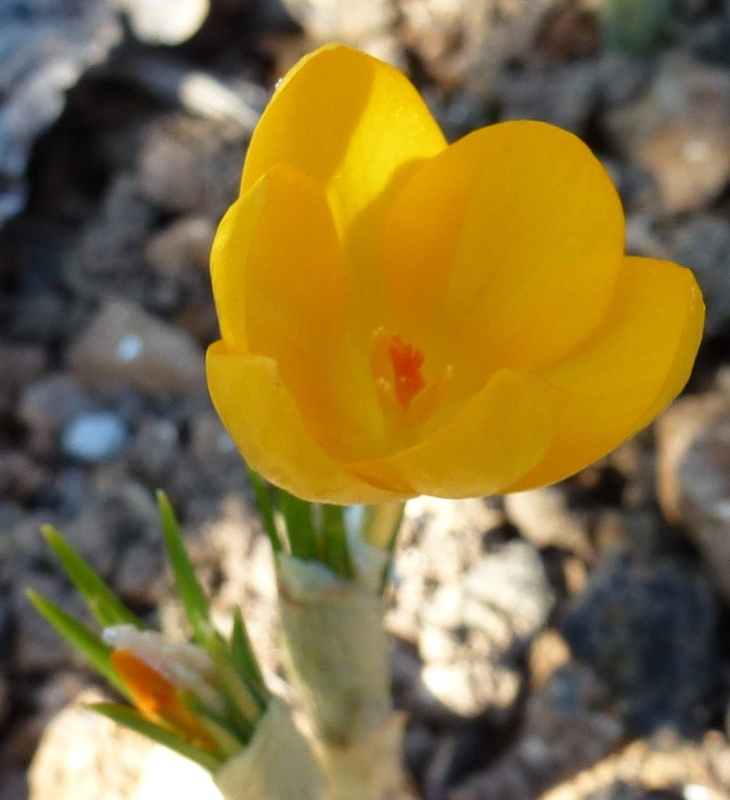 I planted these yellow Crocus Ancyrensis last autumn, I love their sunny colour. 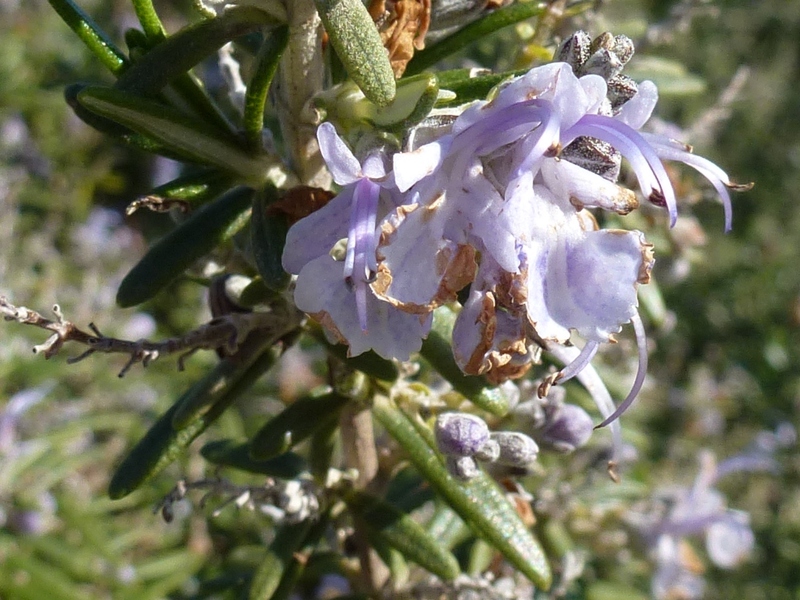 Rosemary continues to attract bees to its masses of blue flowers. 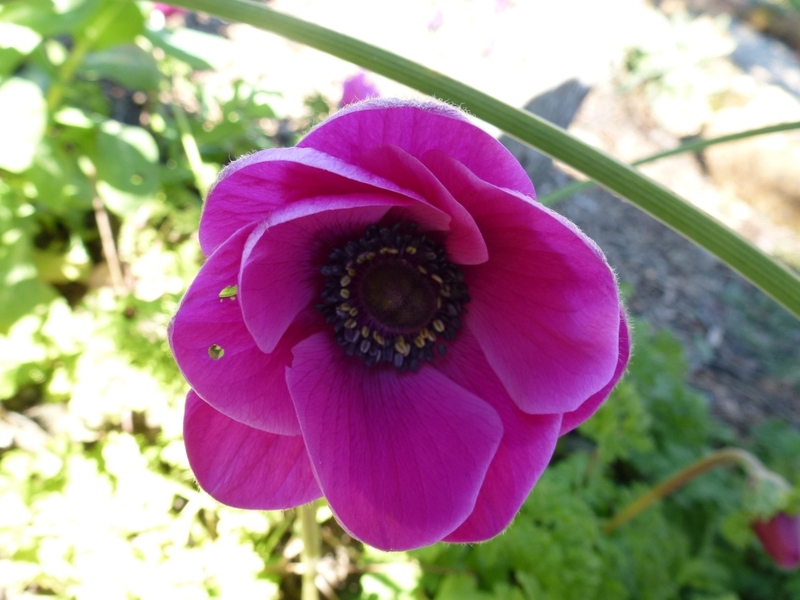 But best of all are the dazzling flowers of Anemone Sylphide; I’ve never manages to grow these before and they are one of my favourite cut flowers too so now I’ve had some success I’ll plant lots more next year! Not only are the colours stunning but the flowers last a long time, I showed the buds just before they opened for last GBBD and this is one of the flowers that was a bud then – I am impressed because we’ve had frosts many of the nights and heavy rain and terrifyingly strong winds and still the flowers are beautiful. Others I planted under the Mulberry tree are slower to flower but that will only extend the season further. 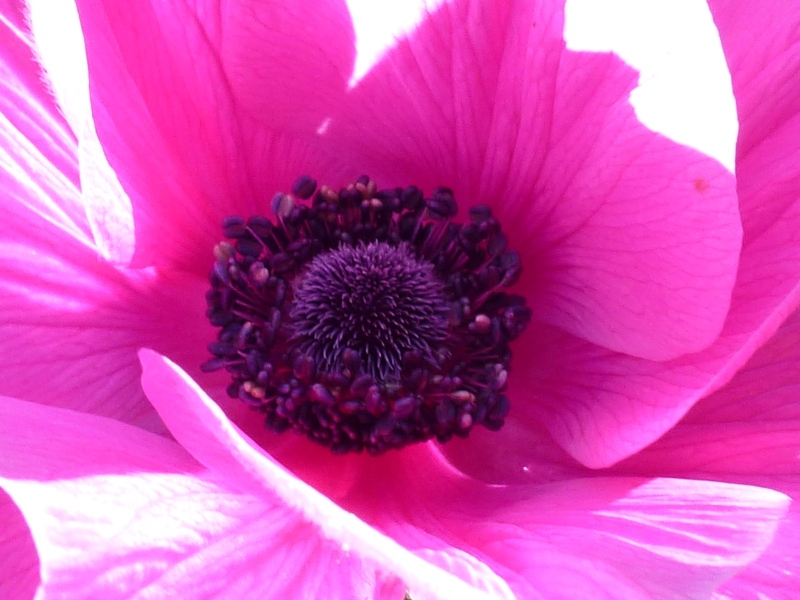 A very happy Bloomday to all gardeners everywhere. Thanks to Carol for hosting. 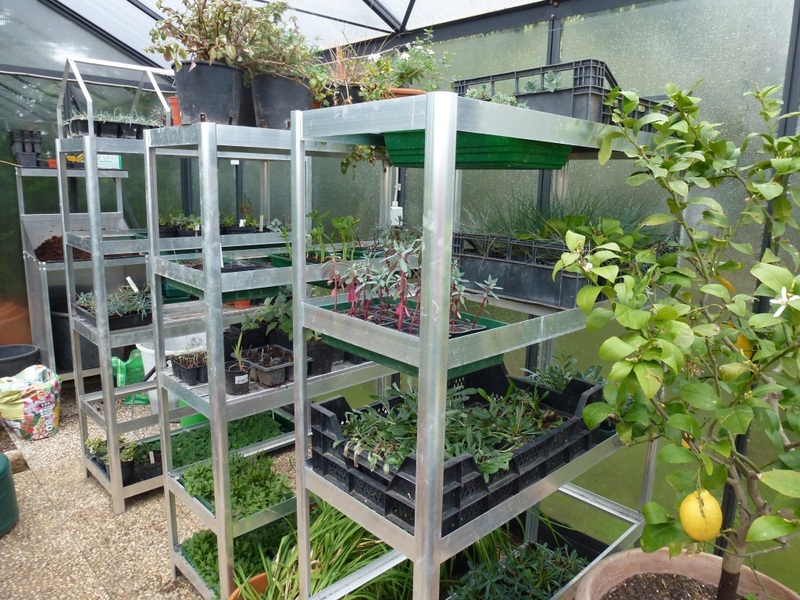 The greenhouse was delivered in March 2011 and so was too late to be used for sowing seeds that year. I also needed to know how hot it would become in summer and if it could be used at all for summer crops. Last year I sowed some seed but I started most indoors on a windowsill but then had to go away so they didn’t do very well as they didn’t receive enough light and I switched the propagator off worried about it starting a fire or just cooking the seeds. I succeeded with sweetcorn (but they didn’t receive enough water when they were planted out so the crop wasn’t as good as other years. To be honest my local supplier has a huge range of small plants ready to plant out in trays of 4, 6, or 12 (depending on type) and that is really about the right number for me to plant. They are usually about a Euro and a pack of seed costs a lot more than that! The only issue is that sometimes the trays aren’t named correctly; two years ago I ended up with a lot of tomatoes all of the same type when I had thought I was buying different varieties. There is also sometimes quite a variation in the quality of the plants, which makes me think that many are grown from saved seeds rather than quality seed. 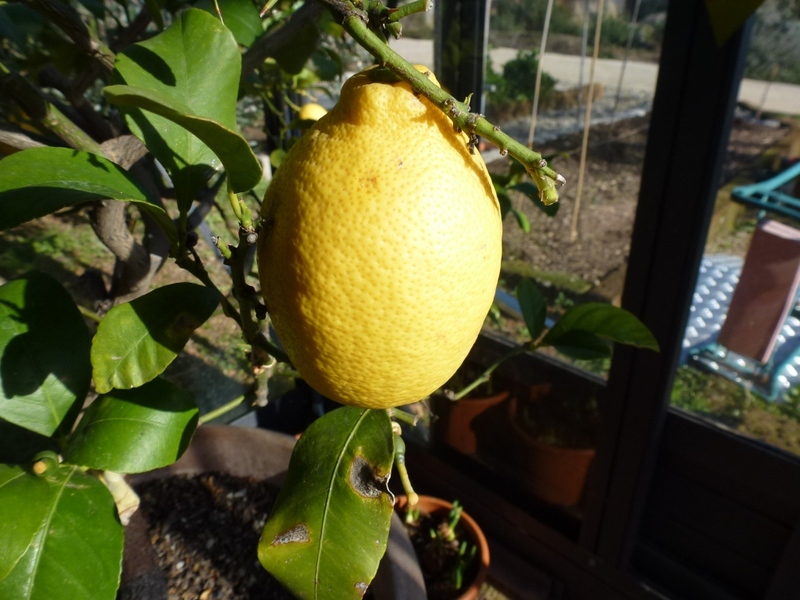 Italian gardeners don’t always want to grow the same vegetables that I do so those I have to grow from seed. Sweetcorn comes into this category – here it is corn (not sweet) and grown as an animal feed, using vast amounts of water too, which never seems very environmentally correct. This year I have started with more purpose! I began on January 19th mainly because my Italian gardening magazine suggested that this was the best day for sowing Aubergines according to the moon. I sowed the following: Verbena ibrida, Nigella African Bride, Aubergine small round Vietnamese seed, Scabious, Suttons mixed, Broad beans, Coriander, Scabious Perfect Blue, Sweet Pea Beaujolais, Pepper New Ace, Pepper Beauty Bell. 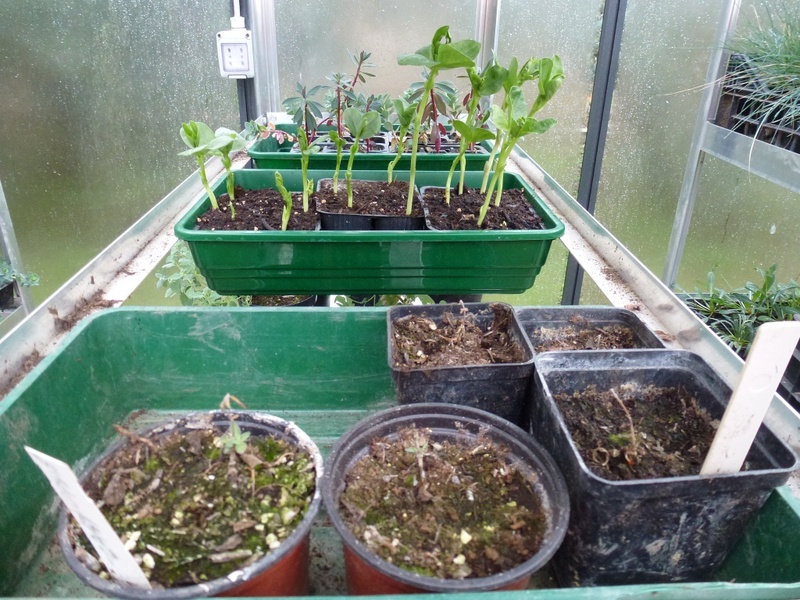 All except the sweet peas went onto a propagating tray at 20°C. But I didn’t use the greenhouse! I thought the great differences from day to night time temperatures might prove a problem so I’ve placed a seed tray stand in the spare bathroom on the third floor of our house. This is giving me some extra exercise as the stairs in the house are all very steep! The peppers and baby aubergines germinated in 11 days as did both varieties of Scabious; the broad beans were quicker at 9 days and the others are yet to germinate. I sowed a lot of the small aubergines as the seed came from Vietnam and I was unsure of how viable it would be. I will have to be very strong willed and only pick out the strongest seedlings. The seeds are germinating quickly (I sowed the following on January 31st: Aubergine, long thin, Vietnamese, Leeks, lungo della Riviera, Helianthemum, rock rose, Digitalis ferruginea, Aubergine, White Egg French, Aubergine Round white flushed pink, French, Aubergine Loa Lavender, French, Clemone Pink Whiskers, Orange scented Thyme, Spinach, Pak Choi Red, Jekka’s Herb Farm, Sweet Marjoram, Monarda Bergamo). Of which the red Pak Choi from Jekka McVicar germinated in TWO days! 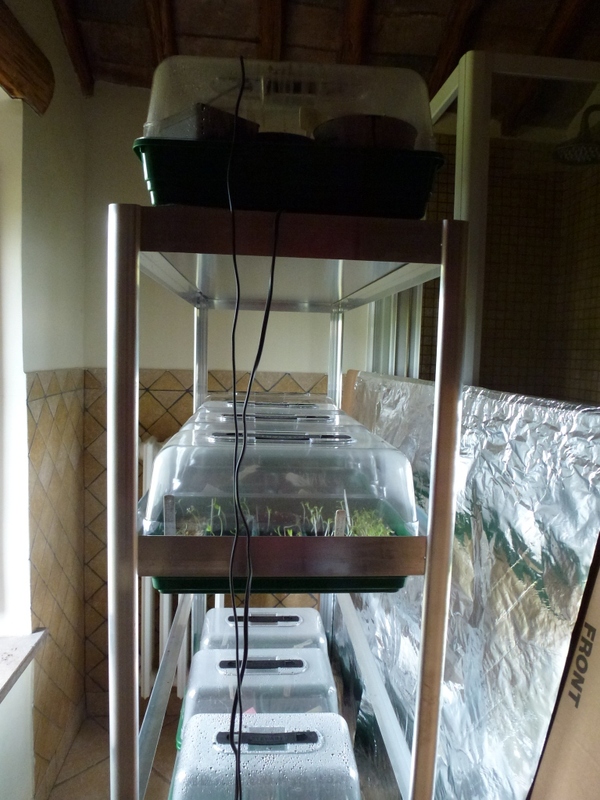 As I removed them from the heated tray and placed them into unheated covered seed-trays I found they were all bending towards the light coming from a north facing window – what to do? I remembered that Janet at Plantalicious had rigged up a board using, I think, foil to throw the light back from the other side. I did the same and so far this is working well. I have already put the Pak Choi into the green house but without a cover as I am concerned that during the day the temperatures can rise. After being badly organised for some time there is now a Max. – Min. thermometer in the green house. I have been taking daily readings. My fears about the variations in temperature are well founded, on Monday (February 4th) the daytime high was 39.7°C (yes that is nearly 40°C! and the night-time low on Sunday night was less than one degree, 0.9°C to be exact. I don’t know how anything is surviving those kinds of temperature variations, but all the cuttings and small plants seem to be Okay. 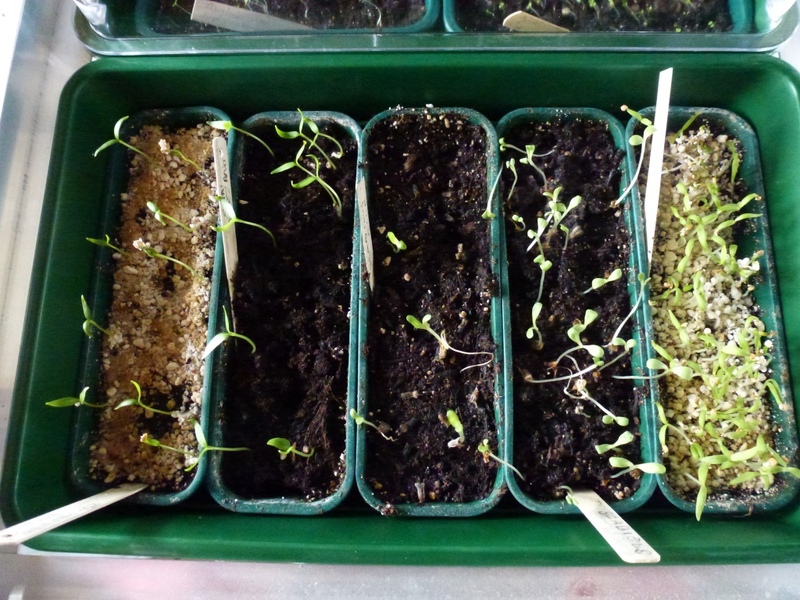 I sowed the following 3rd February: Pak Choi green, Lettuce, Oak Leaf, Lettuce, Red Romaine, Parsley, Peppers d’Asti. The Pac Choi has already germinated as has the Romaine lettuce. So I can look forward to some hours of pricking out as soon as the first true leaves have formed! We were away for last month’s Harvest day so I thought I’d better make sure I noted down what we are eating from the garden now so that I know for next year. 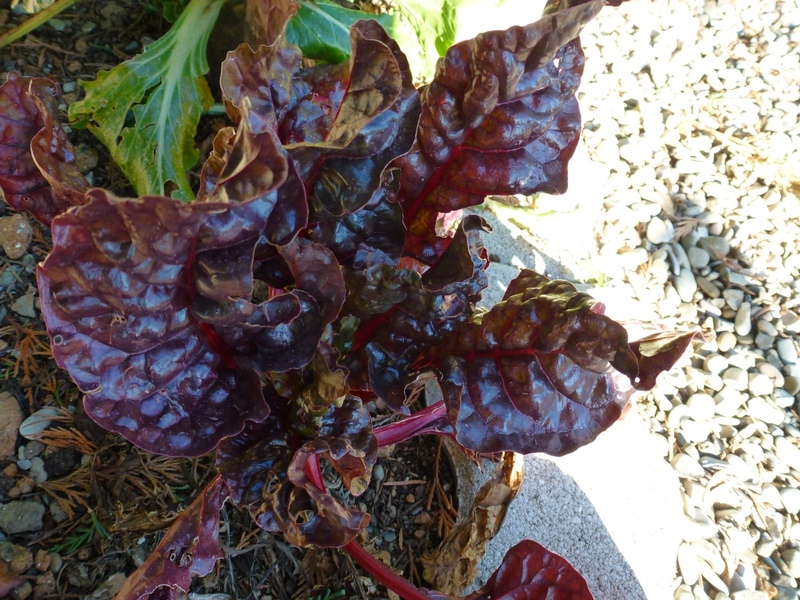 There isn’t a great variety, but what there is, is good and I have plans to grow more things next winter (Good Greif, am I thinking of next winter already and this one’s not even over yet!). 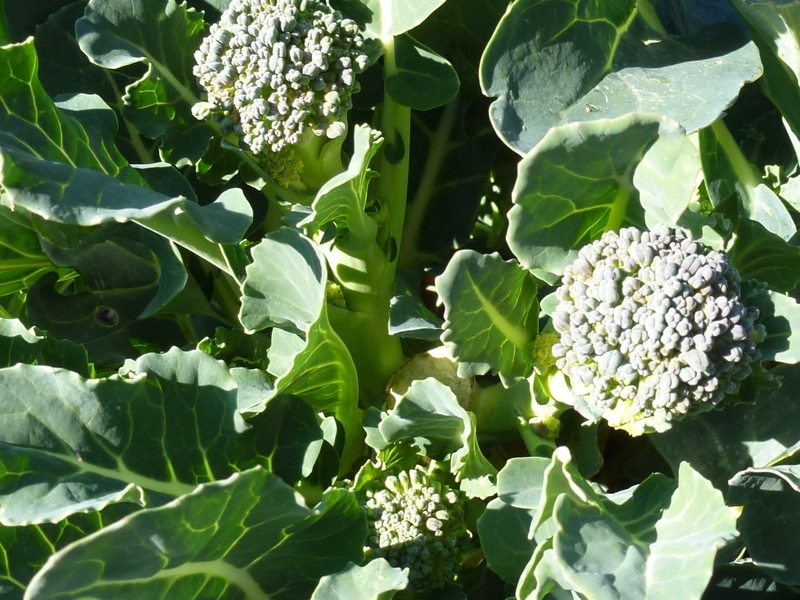 There are secondary heads on the Calabrese, enough to pick some every week, I love this so will definitely try to grow even more next winter, it is better value than Purple spouting broccoli that has to be in the ground from August/September and really only produces for a few weeks. 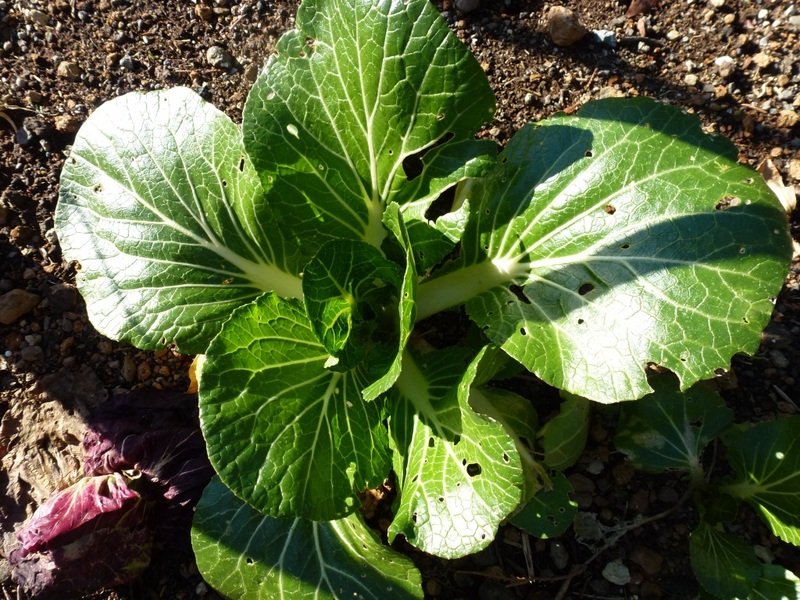 Pak Choi is actually growing even with freezing nights and some arm days, another chop I want to have available for much of the year. 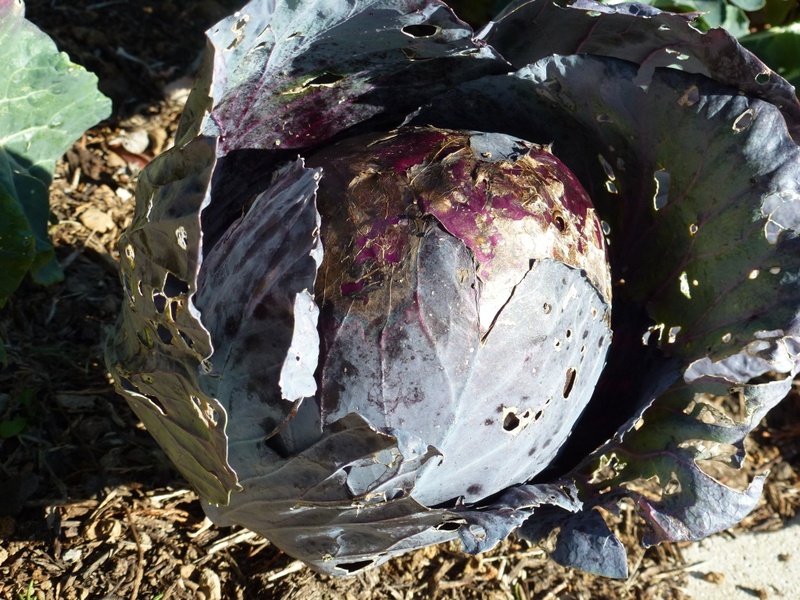 It can be picked for salads when young but usually grows to harvesting size very quickly so a good infill crop. I sowed some red Pak Choi in a heated propagator and it germinated in two, yes that’s TWO DAYS! 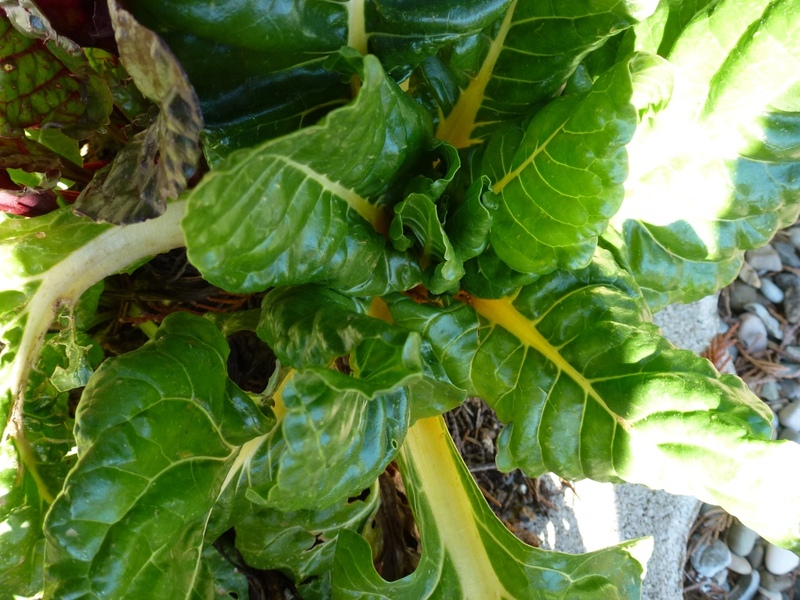 Swiss Chard is giving us some fresh leaves on a regular basis. 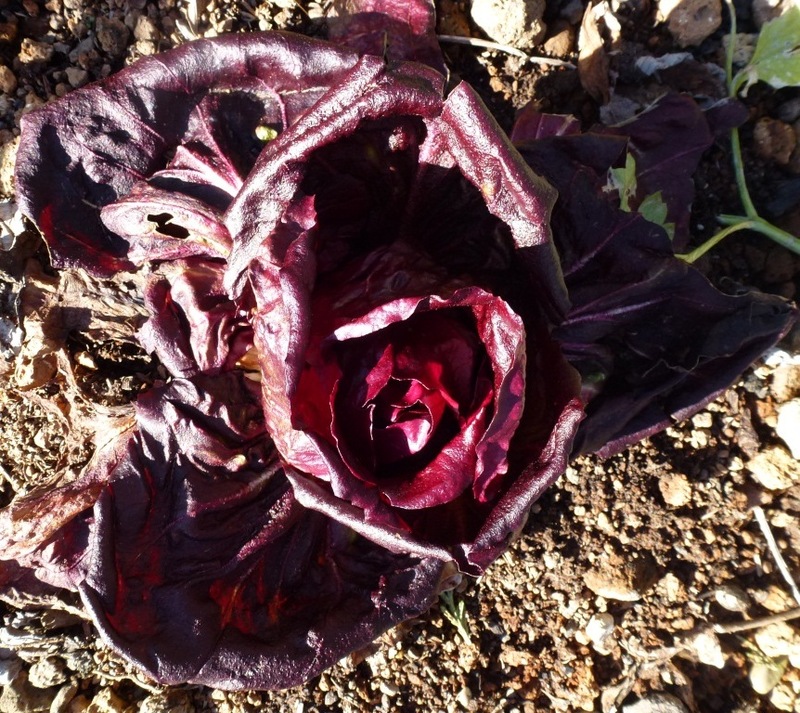 I still have 2 more red cabbages, I’ve been stir frying it with sliced onions and ginger. 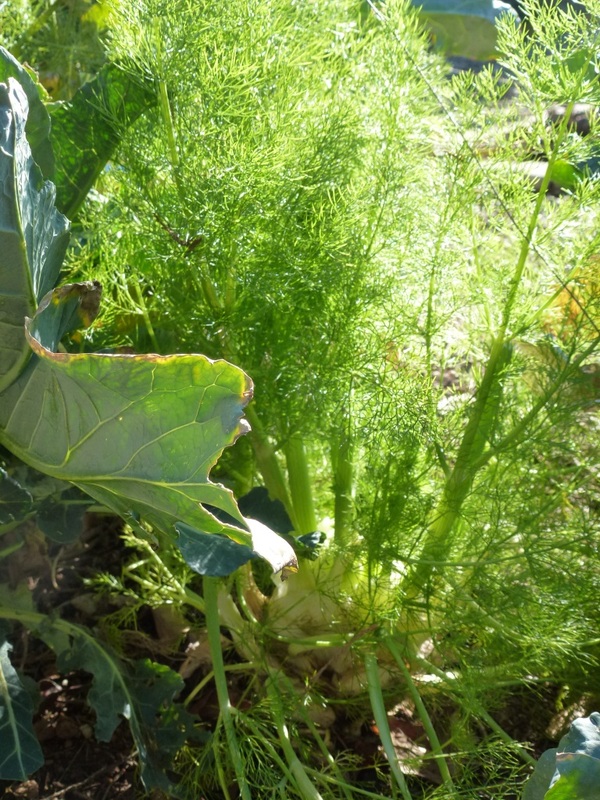 The Florence fennel I planted between the Calabrese has survived; I’ve never had any in January or February before – it might be a good crop to try in the greenhouse over winter. The dwarf beans I sowed are alive and did have flowers but there’s no sign of any actual beans! Leeks are one of my favourite winter vegetables and as I didn’t grow so many onions last year, and we’ve eaten all that I grew already, I use leeks in recipes that say onions; this is nice as the leeks give a slightly sweeter flavour so make things taste different. 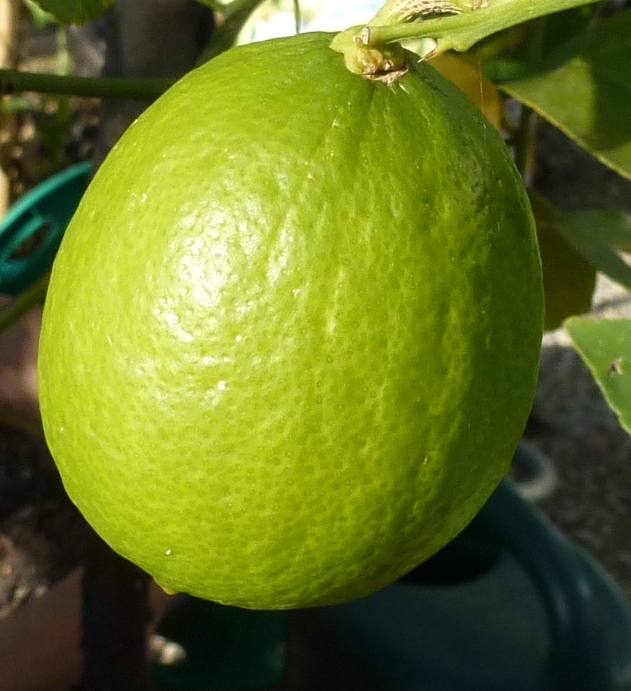 Lemons and limes are available from the greenhouse and new flowers are forming making a visit into the greenhouse a very sensual experience. I have rosemary, salvia, parsley, mint and amazingly still green Marjoram, I dried some leaves as it is one of the few herbs that is actually better dry than fresh; in summer it is often not so good to dry (or I miss the correct moment) so I’m happy to have it now. There is some Syrian thyme in the greenhouse but all of the plants outside die as soon as it gets cold, they seem to behave as annuals. 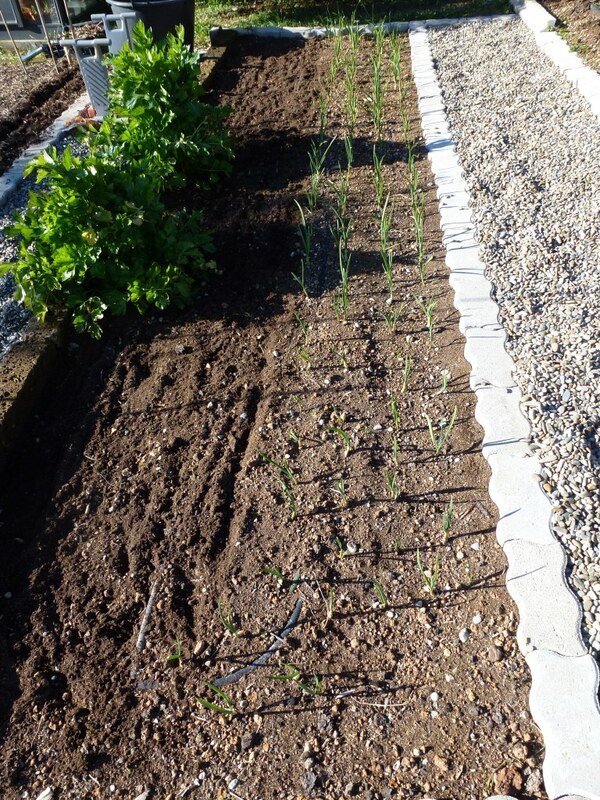 Today I planted some red and yellow onion sets, I hope I’m not tempting fate too much by planting them now.